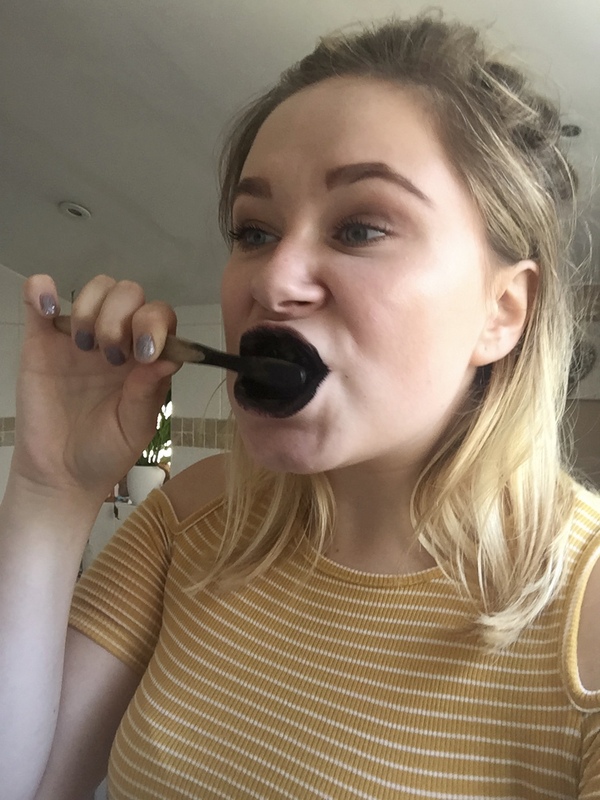 At the moment everybody is going crazy for activated charcoal products! 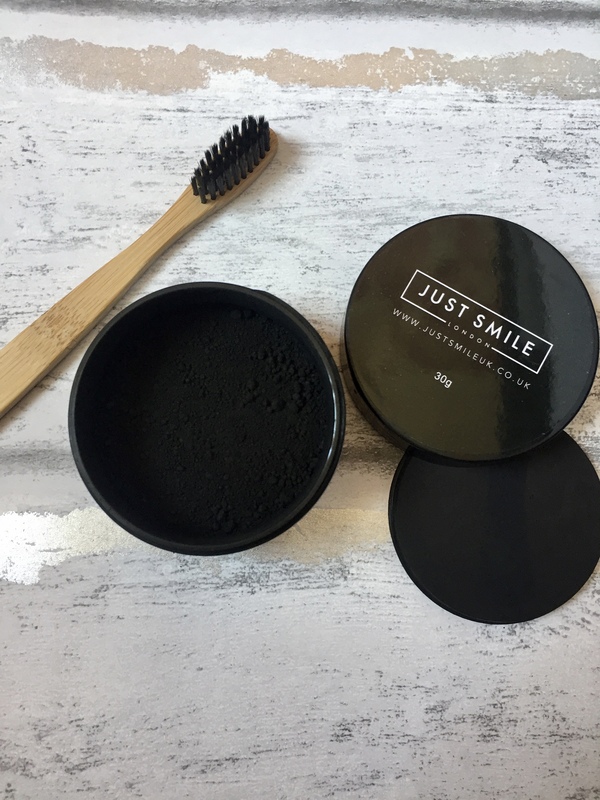 Charcoal body scrubs, charcoal nose strips, charcoal face scrubs and this post is just going to add to the craziness, as I am going to be talking about Just Smile UK activated charcoal teeth whitening. If you are looking for an easy, affordable teeth whitening product, that causes no stress and aggro then you have come to the right place! I have been absolutely loving using this product and have been using it for a while now. I completely forgot to take a picture of my teeth before I started using it as I was so excited to use it, which is annoying now but you are just going to have to take my word for it! 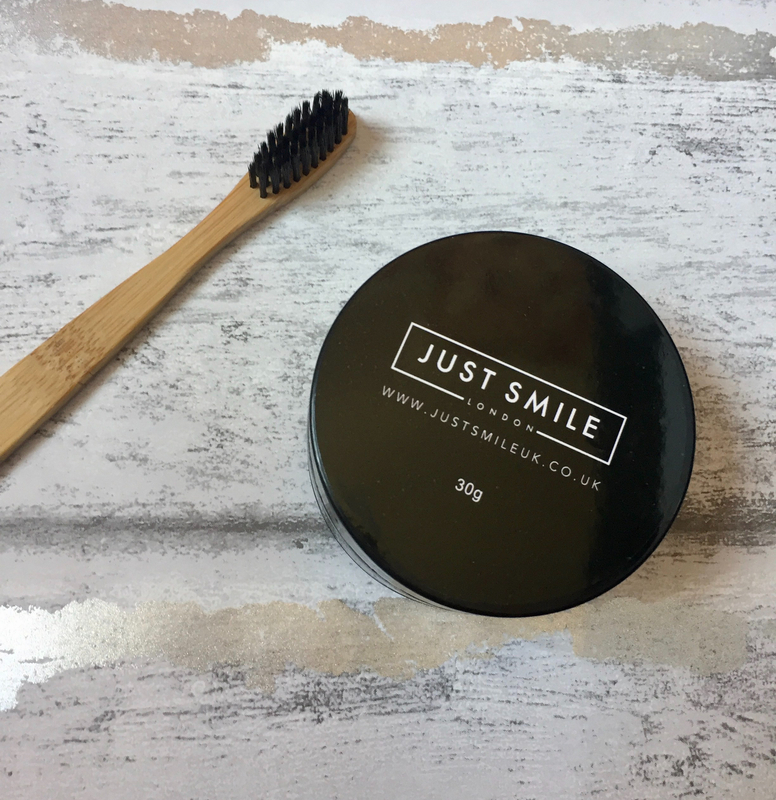 Just Smile are a 100% natural solution to teeth whitening that only takes 3-5 minutes of your daily life. It is super easy to use and it is a product that after one use you will become addicted to because you will love the results! After once use ( I can honestly, HONESTLY ) say this, your teeth WILL be a shade whiter then they were before! I was shocked as to how good this product was, even after one use! It is a powder formula, which is different from what I have ever used before. I would recommend using this and then brushing your teeth again after. A little bit of the powder goes A LONG WAY I can’t stress that enough, you only have to tap the end of the brush in and that is more than enough! This product is going to last you so long, if you think about how much of the powder is in the tub, there is actually a lot! THIS MAKES ME SO HAPPY! 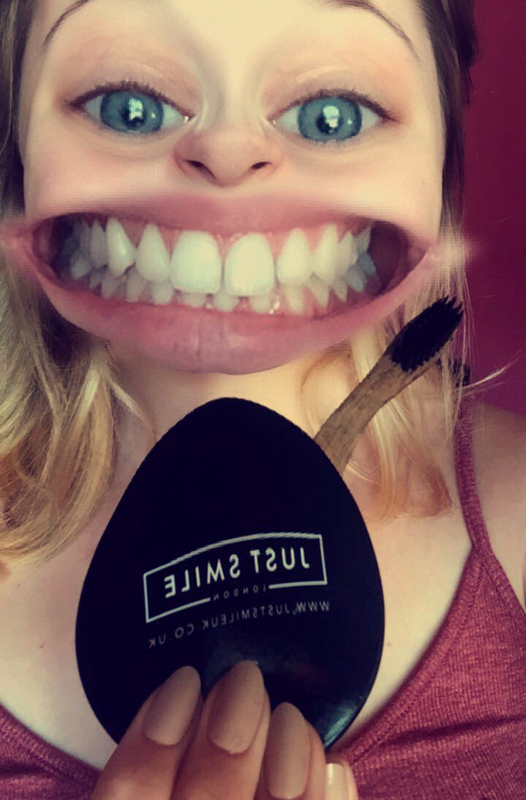 When you order online you can get the actual teeth whitening product and the bamboo tooth brush which is such a good deal and a fab combo! You don’t want to be using your everyday toothbrush as it will turn black. Also the bristles on this brush are really good as they area bit firmer then the normal bristles on a normal brush. This is going to really scrub the charcoal onto your teeth! The packaging of the product is really sleek, its simple and makes a statement. The good thing about this product is that you don’t even have to leave the house, you can order it and it will be there within a couple of days. Mine arrived SO quick! 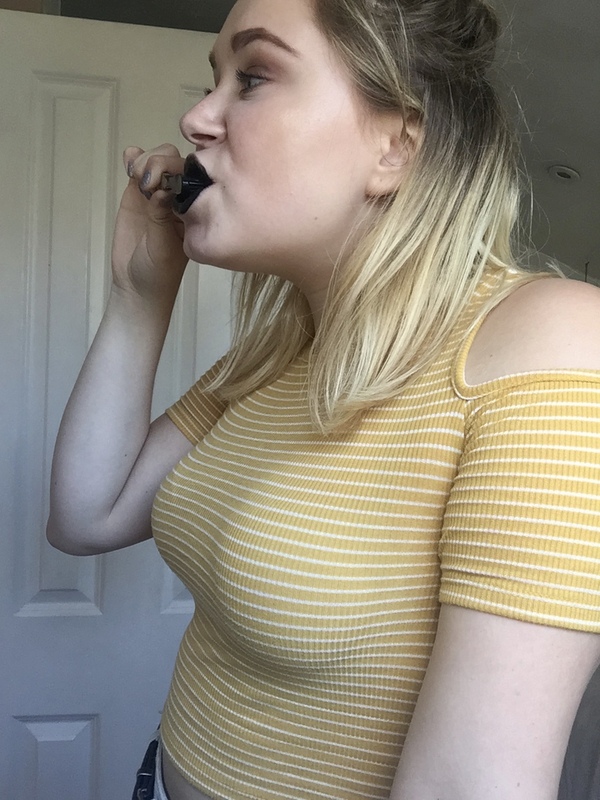 I really enjoy using this product, it is sooo easy to use and after the first time I used it I was honestly shocked guys! I remember showing my mum and she went “oh yes they do look whiter” literally haha! I really wish I took a picture to show you, but I got so excited to use it I completely forgot! You only have to use it twice a day for about about 3 times a week because the job is so well done even after one brush. I like that you don’t have to use it everyday like other teeth whitening products, but I can honestly see why you don’t have to use it every day. This is a powdered formula which was different from anything I had previously used, I didn’t know how I felt about it at first but I have enjoyed using it. I think because it is dry, it does a lot more to your teeth then a product such as a toothpaste teeth whitening product. Having a powdered product I will say for me has been a tiny bit messier then it would be with a teeth whitening tooth bath, but I don’t mind if I know the results I am getting are going to be worth it. To be honest, I am so clumsy so this doesn’t help ( my mum can vouch for this ) I have genuinely enjoyed using it, as I feel like I am taking more time out of my day to focus on my appearance and I love that. I also feel much more confident since using it which I think is important! Teeth whitening products are good and when you find one that is sooo affordable and really works then anyone is going to be happy. If this seems like your sort of thing then you will become obsessed with it, just like I am. After you have brushed, spit and rinse out. Make sure you rinse well and that it is clear. Make sure you have secured the lid on the product as you don’t want any falling out. You can buy this product from Just Smile UK it was originally £16.99, but is now £12.99 which I think is such a good price, considering some of these products can be more expensive in high street shops! BUT, if you use the code ” SOPHIAT10 ” you will receive an additional 10% off!! MORE MONEY OFF?! (this will include the teeth whitneing product and the free bamboo toothbrush)!!! I’m loving the charcoal hype at the moment so this seems really exciting! I always find brushing my teeth to be so boring but this looks like good fun and even better that it works! This looks really good. I have been using charcoal soap and face packs and found them super effective. I must try this one too. Tempted to try, how is the taste though? Tvoji zubi izgledaju predivno. ali meni se ne dopada crna boja na zubima. I have been seeing so many different whitening toothpastes and I use a charcoal activated face mask. I think I would love to try a charcoal activated toothpaste after seeing your teeth. Thank​ you. Oh that is so crap, I wonder why? oh I see, that might be why. it is so annoying when you use products and they just don’t work. It is alright and okay let know if what you think if you decide to get it!